Making your own nut milk is a lot easier than you'd expect, and this recipe from Whitney Helena of Nourished Plate is delicious in coffee, cereal and anywhere else! 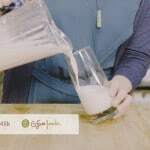 Whitney Helena from Nourished Plate joined me in the kitchen to show you how to make Nut Milk at home. It’s easy, and totally delish. Soak the nuts 12-36 hours: Place the nuts in a bowl and cover with about an inch of filtered water, at least overnight. The longer the nuts soak, the creamier the milk. Almonds & hazelnuts will particularly benefit from 24+ hours of soaking. Drain the nuts from their soaking water and rinse them thoroughly under cool running water. Combine the nuts and 2 cups filtered water in a blender or food processor. Spin for 2-3 minutes, until the nuts are a fine meal and the water is opaque. Pause to scrape down sides if needed. Sweeten to taste, add vanilla if desired. Store the nut milk in a sealed container in the refrigerator for up to three days. This entry was posted in Beverages, Dairy Free, Paleo Friendly, Recipes, Tips & Tricks and tagged almond milk, autism gluten free, celiac disease, celiac health, dairy free, food allergies, g-free, G-Free Foodie, G-Free Foodie Product Reviews, gluten free, gluten free cooking, gluten free diet, gluten free food, gluten free health, hazelnut milk, nut milk. Bookmark the permalink.